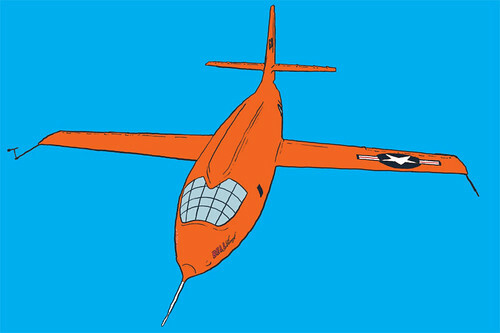 A drawing of the Bell X-1, the first plane to break the sound barrier*. First flight in 1946. Design inspired by a rifle bullet because that was the only thing anyone could think of in 1945 that was supersonic. *a German pilot claimed to have broken the sound barrier while diving in a Me-262 in 1945, but nobody really takes the claim seriously. I’ll be drawing a lot of planes in the near future, as a warmup for the next biggish project.